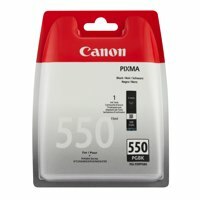 Install a Canon Black 550 Inkjet Cartridge for outstanding results from your Canon PIXMA inkjet printer. The 550 cartridge uses high-quality ink specially formulated for the best results from the MG545, MG6350 and iP7250 printers, with a cartridge optimised for reliable high-speed print output. Pigment-based ink ensures crisp and black text for stunning documents.